I've been posting beautiful paintings by DinoBoy which he had done during his art classes in HeART Studio. Recently I had my chance of getting my fingers and hands dirty with oil pastels to draw my first canvas painting. I was very excited because I have never thought that I could have a chance to do that! 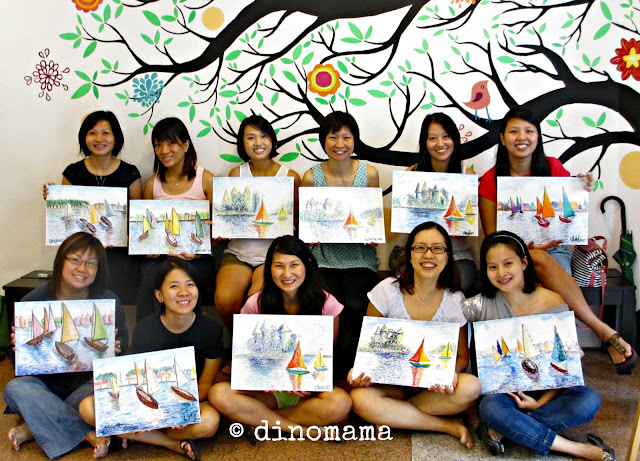 In this exclusive class for Singapore Mom Bloggers mummies, most of us do not have any art training or background so every one's as excited as me. 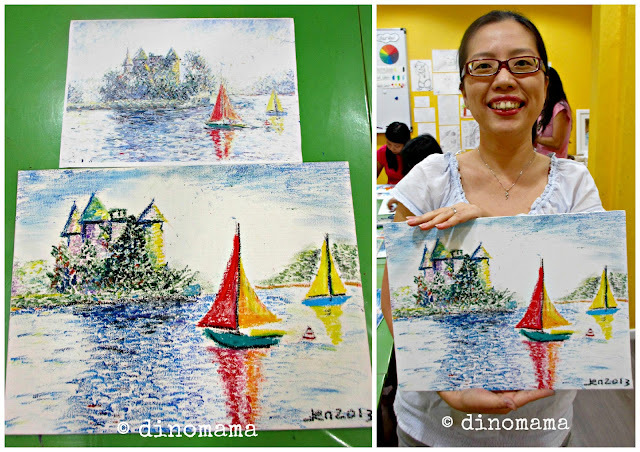 HeART Studio has arranged Teacher Elma and Teacher Gazz to coach us, we will be using oil pastels to recreate 2 different painting; Harbor Scene & Le chateau des seigneurs d'Estaing a Bort-les-Orgues, both painted by French painter Hughes Claude Pissarro. Teacher Gazz and Teacher Elma starts to do a brief introduction about the painter, the short quick strokes technique and the medium that we will be using for the painting. 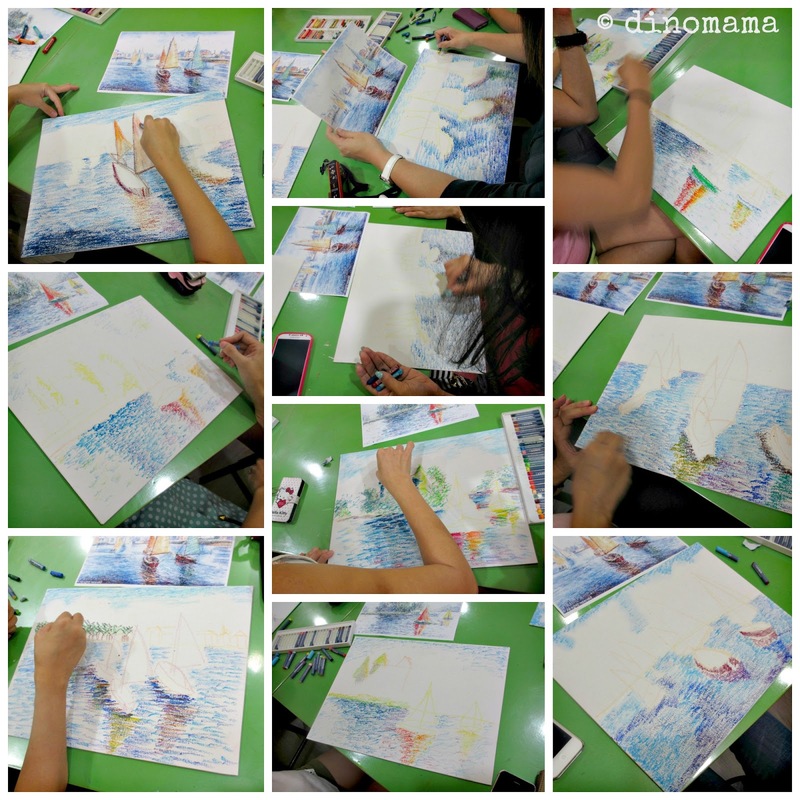 We were taught to use a light colored oil pastels like beige, cream, almond to draw the horizon and outline the main subjects which in this case are the sails. After that we can start to fill the sky, water and the landscape with colors by using short quick strokes, leaving the main subject; which in this case, are the sails, to the last. We also lean to use the white color pastel to blend in the colors or to lighten it, or our fingers to blend the colors. Dark or black colors should be used last in case we made a mistake and its difficult to correct it or we accidentally pressed on the colors and imprint it on other parts of the painting. Look at all the other mummies' painting! We are really concentrating, too busy to chit chat, all you can hear in the class room are the "tok tok tok" sound of the oil pastels hitting the canvas - hard & fierce, like we are venting our pent up frustrations on the canvas. It was really an interesting and eye opening 2 hours experience. 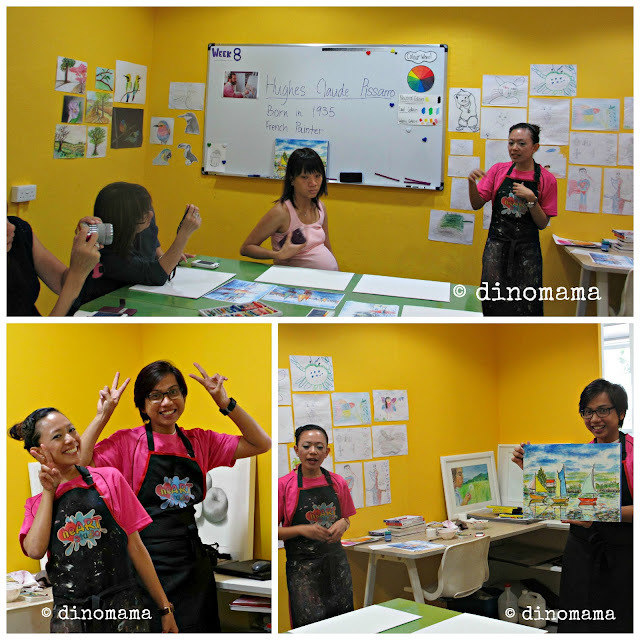 I was stuck a few times, unsure which colors to use but luckily Teacher Elma & Teacher Gazz was there to guide me. Teacher Elma asked if I learn some tips from DinoBoy as I am doing quite well for a first timer. Well, I always suspect that I have a little bit of artsy genes in me, since the 4 of us has been doodling when we were younger and Sis has made a career in the graphic designer line, while younger bro is in web design, so I can't be very far from them right? Here is me with my canvas painting, looks pro or not? Anyone wanna buy it? Anyway, in case you are in HeART Studio, look around and you may spot my painting some where in the school. Here's us with our masterpiece! Pretty sight isn't it? If we can paint such a beautiful canvas painting under the guidance of 2 great & patient teachers, I am sure you can too! If you are keen to learn canvas painting, HeART Studio conducts adult canvas classes to teach basic art sketching to canvas art but they need a minimum of 2 people to start a class. Get the husband to join for a weekly calm & therapeutic couple dating? The school also offers art classes for children 3 - 12 years old, so perhaps you can sign up together with your child and paint together! What a great way to bond with your child! 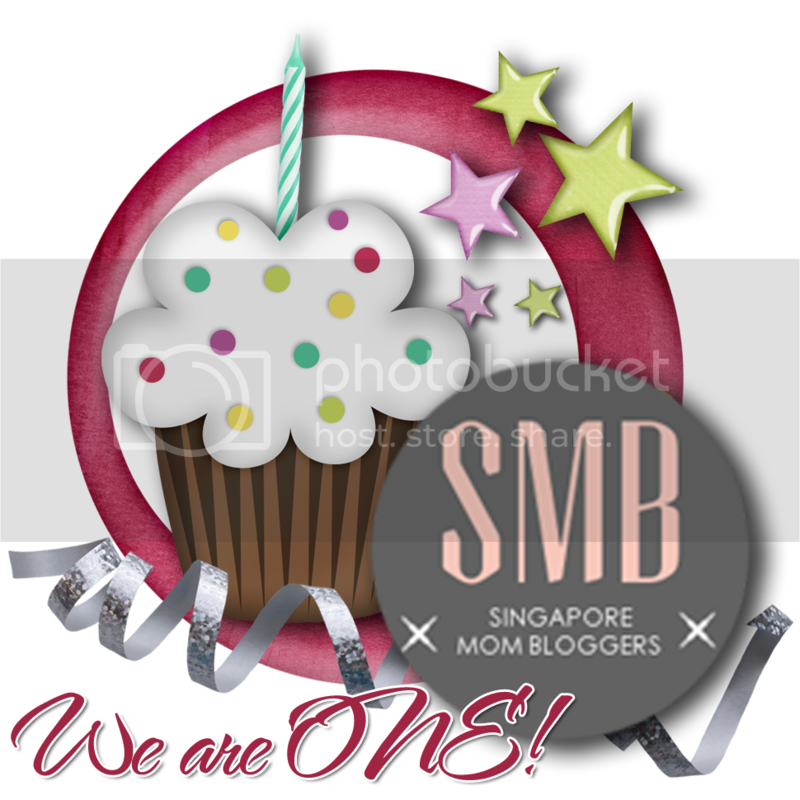 A big Thank You to Singapore Mom Bloggers for organising this canvas art session that was kindly sponsored by HeART Studio in celebration of our 1st birthday celebration.